President Barack Obama speaks to the media about the recent problems at the Veterans Affairs Department in the Brady Press Briefing Room at the White House May 21, 2014, in Washington, D.C.
President Barack Obama slammed the alleged misconduct at the Department of Veterans Affairs in a White House press briefing on Wednesday, saying that the situation would be taken seriously, ABC News reports. The president said that if claims of a cover-up of gross delays in treatment for returning members of the military turned out to be true, those responsible would be dealt with accordingly. "It is dishonorable, it is disgraceful and I will not tolerate it, period," Obama said, minutes after meeting with Veterans Affairs Secretary Eric Shinseki in the Oval Office. "I know that people are angry and want swift reckoning. I sympathize with that. But we have to let the investigators do their job and get to the bottom of what happened. Our veterans deserve to know the facts. Their families deserve to know the facts. 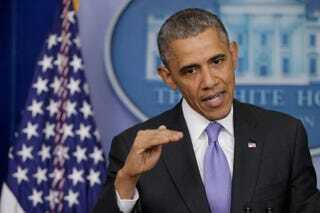 Once we know the facts, I assure you, if there is misconduct, it will be punished," Obama said, according to the news site. News of the alleged misconduct has spread like wildfire in recent days, since claims were first made that doctors at a VA facility in Phoenix were told to put the names of patients on a hidden waiting list until a spot opened up on the official list, in order to make the wait times seem shorter, the Chicago Tribune notes. A few senior officials in the Arizona capital were put on leave, while two health officials in the Veterans Affairs Department have resigned. The scandal is alleged to extend beyond Phoenix, with approximately 26 other VA medical facilities under investigation, the Tribune notes. Read more at ABC News and the Chicago Tribune.